In the late 1990s all information about asset-backed securities was transferred among organizations such as rating agencies and bond insurers via fax. The concept of ABSNet was to gather all of this information from its primary sources, normalize and integrate it into a database, and make it available through a website - known as ABSNet. In addition to access to this information, the website featured trend analysis including charts, and industry-relevant newsfeeds. The capabilities are explained in more detail in this brochure. Typical website architectures at that time (1998) directly connected to a database in response to each user action, which resulted in slower response times as the systems became congested. 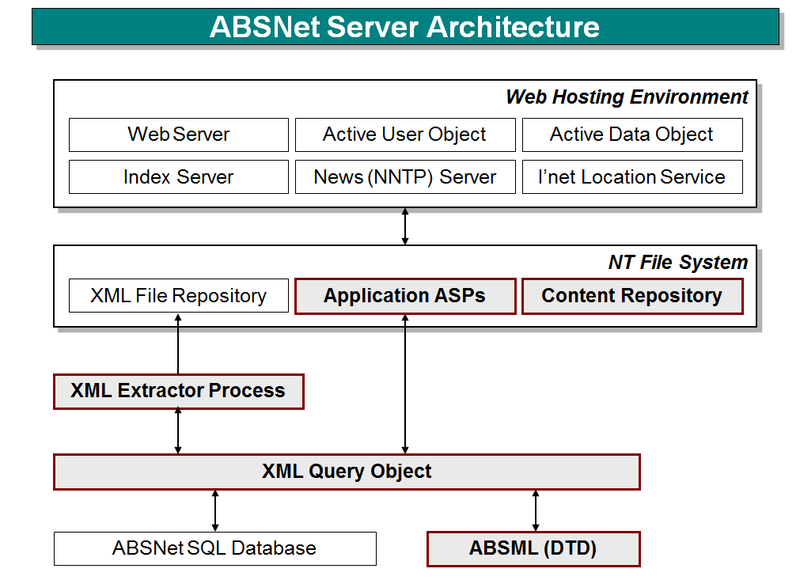 Instead, ABSNet employed the emerging technology of XML. On a regular basis, the database was exported to a large set of XML files that represented every deal in the database. Then a search engine was used to index the set of XML files and return queries from the website. This architecture not only held very high performance under system load, but it decoupled the website from the database schema, so that the constant redesign changes of the database never broke the website or caused the website to have a disruption in service. Here's the original pitch made to the executives at Lewtan Technologies.